BioWare’s first MMO will never be the game Galaxies fans want it to be. And that’s fine – Star Wars: The Old Republic is quite good in its own right. But it can learn lessons from its predecessor, and ensure players are inhabiting its world rather than just passing through. That’s what next week’s Galactic Strongholds expansion is all about: habitation. Or as BioWare put it, “customizable bastions of personal luxury”. Strongholds, the expansion’s headline feature, are personal palaces for players to retire to. They’ll be able to decorate their new abodes with tables and chairs (or thrones), and hang up pictures of their greatest conquests. If any of those villains had tusks, you imagine they’d get a spot over the mantlepiece. It’s going to be that sort of house. Guilds are getting the group equivalent: Flagships. There, they’ll be able to fill up their hangars with spaceships shaped like letters. There’s intriguing talk of orbital support and temporarily conquering planets. Players can settle down on one of four planets, including Tatooine, or even build a Stronghold on each. 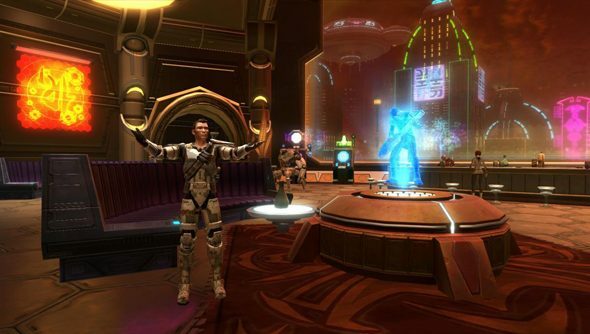 Subscribers will get to move into Nar Shaddaa early, from August 19. Housing will become available to preferred status players on September 16, and the rest, belatedly, on October 14. Can you wait till then?